InJuly 2014, I returned back to Bullen as President after a season in church leadership in Washington, DC metro area. In my current role, I strive to lead with humility and integrity, cultivating a culture of trust and respect to encourage innovation, collaboration, and strong communication. 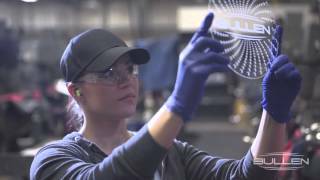 Managing $25M in revenue and 130 employees in semiconductor, aerospace, defense, medical, and automotive industries. The company has grown from $8M in revenue and 65 employees in 2014. Bullen Semiconductor (BSC) is a world leader in providing silicon spare products to the semiconductor high tech industry. Annual sales of BSC were projected to be $125 million in 2008. 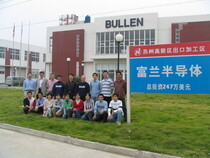 Bullen Ultrasonics was purchased by Lam Research in November of 2006. Lam Research (LRCX: NASDAQ) is a $2.5 billion semiconductor equipment company. I was asked by the President of Bullen Ultrasonics (BUI) to lead the first international expansion of the company to Asia. I established the company as a Wholly Owned Foreign Enterprise in Suzhou, China in 2003. I then provided senior level oversight to the renovation of the new facility and the qualification of the facility for production. As the Asian Coordinator, the General Manager of the Suzhou Facility reported directly to me. I reported direct to the President and was responsible for the overall financial health, the product line provided direct to Bullen's largest customer, Human Resources, IT, Facilities, and Logistics. A total of 40 employees reported indirectly to me via the General Manager. The annual revenue of the Suzhou, China Facility was around $6M. The position required presentations to be made to the Board of Directors, all employees during company meetings, government officials, and customers. I worked closely with the President in developing overall strategy and organizational alignment for the Suzhou Facility. This included alignment of corporate goals with individual objectives for the General Manager and all employees at the Suzhou site. I was asked by the President of BUI to manage customer relationships previously managed personally by him. I managed a broad customer base in Singapore, Japan, Taiwan, Holland, and the United States with annual revenue of $5M. I was hired as a Full Time Youth Worker and was promoted to the Administrator of the center with a staff of 20 adults and 20 residents. Triple L Youth Center was an independent living center for teenagers ranging in ages between14-18 who desired to learn independent living skills. As the Administrator, I was directly responsible to the CEO for strategic planning, evaluation of the staff, facility management, human resources, and presentations to the Board of Directors when required. I enjoy running and have competed in several half marathons and a full marathon. 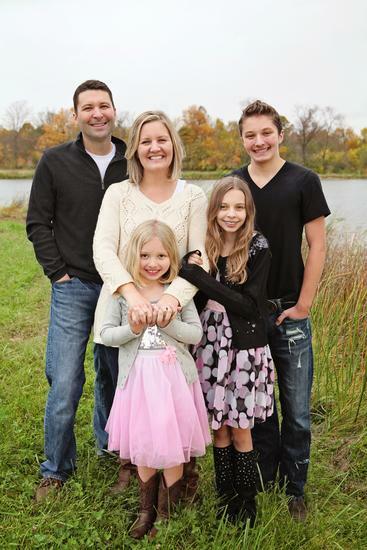 I have been married to my wife, Heather, since 1995 and have three wonderful children. Michael (1998), Annabel (2002), and Lucy (2007). I served on the Advisory Board for Ohio MEP from 2016-2018, advising the current Director. I also was able to visit Senators and Congressional Leaders as part of a larger delegation in 2018. I am currently a small group leader of business owners in OneLife at Vineyard Cincinnati church. This involves leading curriculum and group discussions about how to integrate faith into leadership roles. My wife, the founder and director, and I served in leadership with a program of World Hope International. C.U.P is a partnership between the rural city of Eaton, OH and five small villages in Sierra Leone, Africa focusing on sustainable rural development. I was able to work directly with the World Hope staff in Makeni by providing a workshop on strategic planning, a leadership retreat, and a training with the Wesleyan pastors. I traveled to Sierra Leone three times from 2006-2008 and worked with the staff to establish yearly budgets and to prioritize projects. First Step is a new program at World Hope International which is working with the Sierra Leone government to create a Fair Trade Export Processing Zone which will court foreign investment to Sierra Leone, increase employment, and improve working conditions. I served on the advisory team and Board. Through the work at Bullen in Suzhou, China, I was able to assist the Chinese house churches through preaching and teaching. I recently put together this video for Bullen to help with marketing efforts. 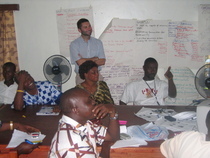 Leading strategic planning with World Hope staff in Makeni, Sierra Leone. The results of the planning session are linked to this photo. This is the report of a training I led in Sierra Leone for local Wesleyan Pastors on behalf of Communities United.